If businessman James Densmore hadn't invested his last 600 dollars in C.L. Sholes' awkward design for a blind writing typewriter, the typewriter might have looked completely different. Like others who were involved with the early development of the machine, including Yost, Densmore eventually produced a machine with his own name on it. 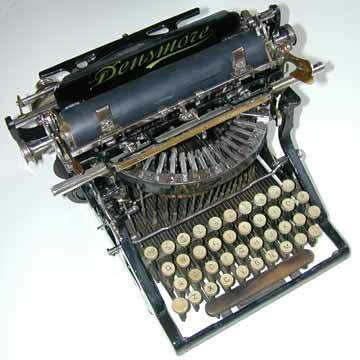 The designers of the 1891 Densmore typewriter were James' brothers Amos and Emmett and Franz Wagner of later Underwood fame. Amos had worked many years on the production of the Sholes & Glidden and Remington typewriters and strongly felt that his design ideas would mean a major improvement. A very important improvement was the suspension of the individual typebars in a way that almost guaranteed proper alignment of the text. Also, five ball bearings were used in each typebar to maintain even and light touch. The carriage comes off the machine, giving access to the mechanisme for maintenance and cleaning (pic. 3). Six years after the introduction of the Densmore 1, a second model appeared that showed some further improvements. The final Densmore model appeared in 1907, the Densmore 5. A Densmore 6 also existed. It was identical to the Densmore 5, but had an added tabulator.